Role: Working to achieve the goals set out in the Care Management Plan, including educational games and group activities, and providing emotional support. By volunteering with Projects Abroad on a Care project in the Philippines you can help by aiding and interacting with children a variety of care centres. Whether you are on a gap year or break from college or coming to development work as an older volunteer on a career break, you will have a role to play and your contribution will be valued. In the Philippines, many thousands of urban children grow up in poverty and are often deprived of basic healthcare and education. Rapid growth and urbanization means that almost half the country’s population now live in towns and cities, making the Philippines one of the most urbanized countries in Southeast Asia. The Philippines is also unfortunately still seeing an increase in the HIV infection rate, with one out of three new cases being in a young person. Children are therefore particularly vulnerable, but by working and interacting with them you can help to improve their future prospects. We have a variety of worthwhile Care projects in the Philippines where you can volunteer to help children from disadvantaged backgrounds or children with special needs. Projects Abroad Care volunteers work in Bogo City, Cebu. Projects Abroad works with day care centres that provide care and education to children from poor backgrounds. Volunteers can have a positive impact on children’s lives by giving them the extra attention and support that they need. Volunteers at the day care centre work with children aged 3 to 15 years. You can help by teaching the younger children basic literacy and numeracy and songs, as well as organizing creative and physical activities such as art and games. With the older children, volunteers can help with homework and practice conversational English. You could also play sports such as basketball, football, and Frisbee, and help kids develop their team skills. Whether you are helping children complete their assignments, playing sports with them, or teaching them a new game, the time and attention you give the children is hugely beneficial. Any skills or talents you have are welcomed. Volunteers who work with special needs children in the Philippines will be placed at a school which has students with disabilities and learning difficulties. Your focus will be on assisting the teachers and giving the children one-on-one attention and support in the classroom. As a volunteer, you will be assigned to a particular classroom, but you are free to meet and spend time with all of the children at lunch time. This is a worthwhile placement, and volunteers need to be proactive for their time to be meaningful. Social development, friendship, and support are the key things you can offer as a volunteer. Volunteers usually start by working about 4 to 5 hours a day. If you live close to your host family you may return home for lunch, otherwise you will be provided with a packed lunch by your host family. Most volunteers work from Monday to Friday and have the weekends free to travel. 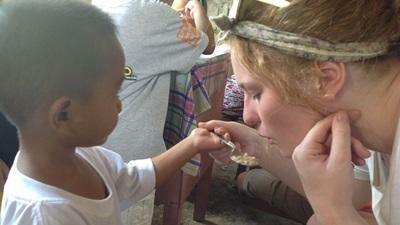 Projects Abroad is happy to provide extra help to volunteers on Care projects. This may include buying some paints or art materials or arranging a day where all the volunteers help to renovate a play area at one of the centres. Suggestions from volunteers are welcomed and we are open to any ideas you may have to help benefit the lives of the children with whom you are working. You can read more detailed information about the aims of the project in our Philippines Care Management Plan. You can join the Care project in the Philippines for two or three weeks if you don't have time to join us for four weeks or more. You will gain a valuable cultural insight and work intensely within the local community. However, please be aware that you may not have the same impact as someone participating for a longer period.